Super BCAA System contains a composition of branched chain amino acids (L-Isoleucine, L-Leucine and L-Valine) in optimal dose ratios enhanced in Vitamin B6 and energizing Taurine in the form of quickly absorbed caplets. Intense workout reduces branched amino acids that build your muscles. 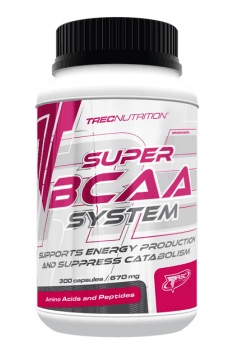 Super BCAA System quickly helps halt catabolism and intensify the regeneration of muscle proteins. The product intensifies muscle strength and mass gain, and considerably improves the efficiency of your body.